Darrah Teitel’s Behaviour is presented by Great Canadian Theatre Company in partnership with SpiderWebShow Performance. Behaviour Script developed in collaboration with Playwrights’ Workshop Montréal. Visit behaviourplay.ca to watch a livestream of the March 27th performance, read resources related to the content of the show, and visit an “Ideas” section full of artistic and thematic writing about Behaviour. Darrah Teitel’s Behaviour is presented by Great Canadian Theatre Company in partnership with SpiderWebShow Performance. Behaviour Script developed in collaboration with Playwrights’ Workshop Montréal. On World Theatre Day on March 27th, with the help of Charles Ketchabaw, we will be livestreaming a performance of Behaviour at behaviourplay.ca. Mariah Horner is an actor, director, indie producer, and scenic designer based in Kingston, Ontario. Co-founding the Cellar Door Project with Devon Jackson in 2013, Mariah has produced twelve shows with the site-specific company in Kingston and Ottawa. Mariah appeared on George Walker's Living in Your Car on HBO Canada. 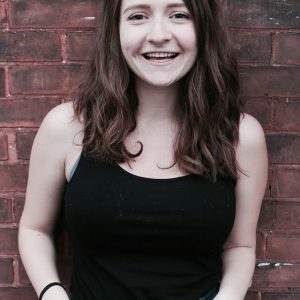 She is currently the Festival Director of the Storefront Fringe Festival in Kingston and is a Metcalf Foundation Intern with both SpiderWebShow and Theatre Kingston. She makes plays in weird places.